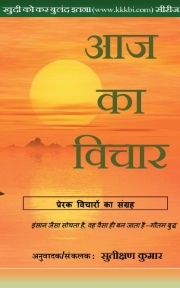 Description of "Aaj Ka Vichar (Vol 1) (eBook)"
This book is a collection of thoughts by various authors. The quality of your thoughts ultimately decides the quality of your life. The effect of thoughts can be seen in the action of any human being. In today's hactic world, most of us are running an endless race for easy money, easy pleasure, easy living and comforts of life. The struggle of life often brings moments of dejections and weariness. At that time, one does need peace and solace, however short lived that be. Few movments free of tension are priceless. In the darker clouds of sadness, a silverline is all you need. The thoughts compiled in this book will not only provide you some moments of relief at difficult times but also guide you in the right direction. I recommend you to read one thought-a-day from this book in the morning and you will be soon able to see the effect of these thoughts in your life. Reviews of "Aaj Ka Vichar (Vol 1) (eBook)"